Get in touch with nature, Southern Oregon's history and your "wild" side on this renowned jet boating adventure that's all about experiencing the Rogue RIver's incredible natural beauty, abundant wildlife and pristine wilderness. This premier jet boat trip offers experienced narrators who highlight Rogue River history, its famous lore and everything else along the way. From 64 to 80 to 104 mile round-trip river adventures, Jerry's Rogue Jets is the only commercial jet boat trip operating in the ‘Wild' section of the Rogue River, and is great family fun that's safe for all ages. Plus, all jet boat pilots are Rogue River Veteran Boat Men and Coast Guard Certified. 35,000 annual travelers can't be wrong! Book a river adventure you'll never forget with Jerry's Rogue Jets today. Operating daily May - October, with departure times beginning at 9am . Jet boat the ‘Historic Mail Boat route' just as Rogue River pioneers have done since 1895. What should I bring on a jet boat trip? A Dress in warm layers with an insulated jacket on top and lighter layers underneath for when it warms up. Sunglasses, digital cameras, sunscreen, water, binoculars and a hat are great to have on hand. Please leave phones and reading material at home. When's the best time of year to plan a jet boat trip? 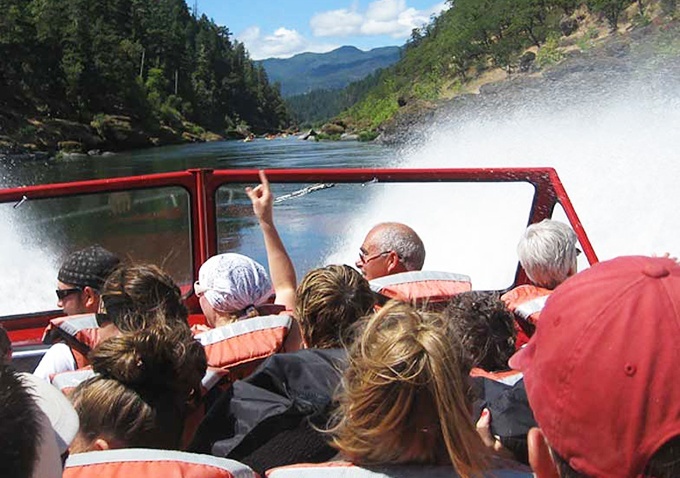 A In Southern Oregon, the best time to experience exciting and family friendly jet boat trips on the Rogue River is from the late spring through the early fall. Generally, the Jet Boat season runs from May 1st until October 15th.